You can’t compare Chelsea with Wigan, but there’s a lesson to be learned from Monday night’s FA Cup heroics by the League One side. Antonio Conte’s Blues go into their Champions League last 16 tie with Barcelona on the back of some poor league results, but also braced with their own baggage from battles with Barcelona. They will surely see themselves in the role of plucky underdog tonight. Despite being equals of the La Liga giants – at the very least, Chelsea are English champions, Barcelona are not Spanish champions – the Blues will certainly feel as though their form and their resources don’t match up to those of Ernesto Valverde’s side. They are one of the most feared teams in the Champions League for a reason. It’s fair to say that the Blues are in a bad moment, their 3-0 victory over West Brom last week was their first league win of 2018. But two big wins in their last two games gives them form going into the European week. And their motivation will be what happened six years ago. 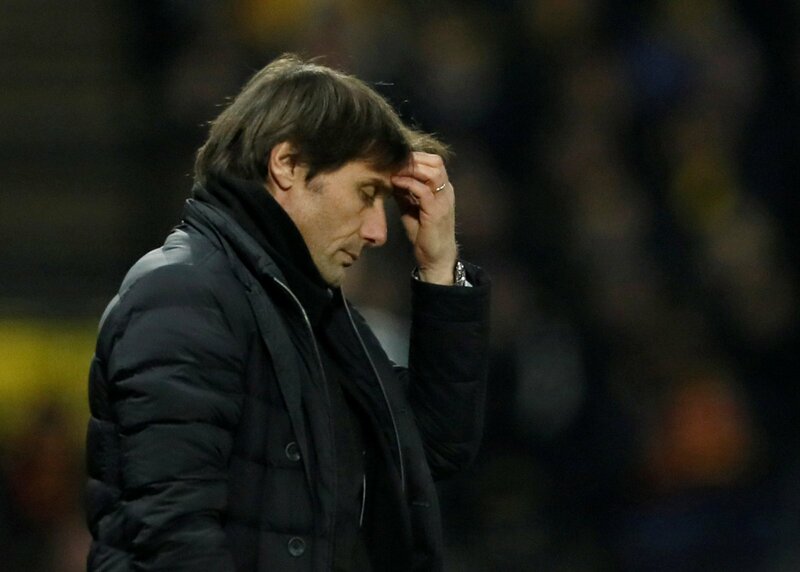 To cast your mind back to 2012, is to delve into a season in which Chelsea were an abject mess – much worse than whatever state they appear to be in now. After the sacking of Andre Villas-Boas – ironically after a West Brom game and also in between two legs of the Champions League last 16 – was the catalyst for change, and Chelsea’s freedom led to their most spectacular success, and probably their most undeserved. But that’s been something of the Chelsea identity since Jose Mourinho first arrived at the club in 2004. It doesn’t matter how nice and pretty your football is, Chelsea’s goal is to beat you. And in a Champions League semi-final against Pep Guardiola’s Barcelona – seen widely as the best club side ever to grace the game – the Blues, now managed by Roberto di Matteo, were not given a prayer. Barcelona were reigning champions, but had been knocked out of the Champions League at the same state two seasons before when an Icelandic volcano’s eruption forced the Camp Nou side to travel to Milan by bus rather than plane, and their tiredness was pounced upon by Mourinho’s Inter who went on to win an historic treble. The Italians’ style of play, though, was an inspiration to Chelsea. These days, it’s par for the course. How many times have we seen even Premier League clubs take the decision to sit deep and attempt only to defend against a top six side? Think almost every game that Manchester City play this season. But in 2012, this was only just coming into fashion. It was how you beat Guardiola’s Barcelona, perhaps, but it was also risky business – sitting deep allows them onto you, and if you do that, you have to be ultra secure in defence. Being ultra secure, however, doesn’t mean having your captain, leader and legend sent off in the first half and his central defensive partner limp off through injury. 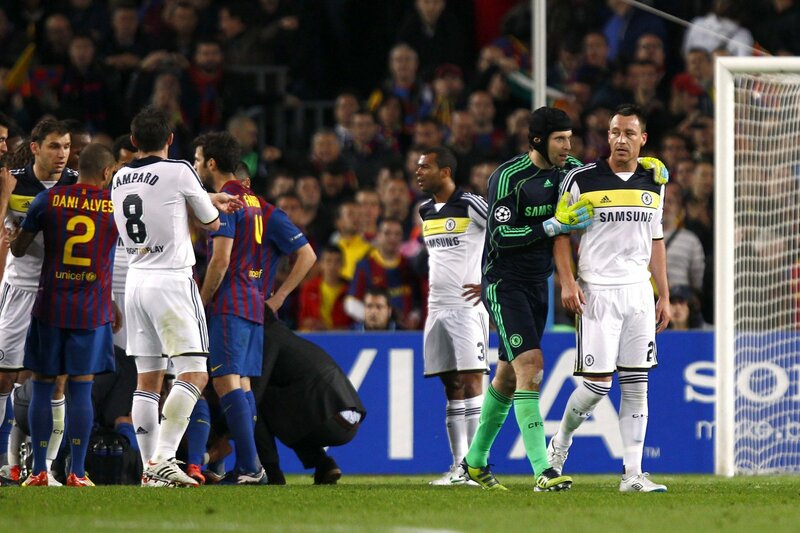 An inexplicable moment of madness meant John Terry saw red for kicking out at Alexis Sanchez after Gary Cahill departed early doors, and with the score already 1-0 to Barcelona, it looked as though Chelsea’s dream had unravelled – especially given the opposition. They went further behind, too, when Andres Iniesta scored just before half time, and the tie was turned. A 1-0 lead that the Blues had taken to the Camp Nou from the first leg at home was now reversed into a 2-1 deficit on aggregate, 2-0 on the night. Because of what happened next, people might forget the role that Ramires played in the comeback. They might also underestimate the psychological element of the victory, too. Having defended manfully against the onslaughts perpetrated by the best team in the world the Blues were dealt a reward for their efforts thanks to a goal by the Brazilian – a sumptuous chip over Victor Valdes – to make it 2-1 on the night, and draw Chelsea level on aggregate, and ahead on away goals. But the most important part of that goal wasn’t its quality but it’s timing. It came directly after Iniesta’s strike, and right on the stroke of half time. There is nothing better than getting that belief-inducing goal just before the half time team talk, nor anything worse than hearing the whistle just after you’ve thrown away the lead you worked so hard to build. It was this belief that gave Chelsea the will to go on and nick a final goal to seal progression to the final thanks to perhaps the defining goal of Fernando Torres’ time in England and definitely the moment that launched Gary Neville’s commentary career. The Goalgasm is the stuff of legends. Torres’ strike doesn’t need any extra narrative, but Neville’s reaction gave it to him anyway. A squeaky, throaty wail wafted over the airwaves and into the homes of everyone watching as Chelsea somehow felled the giant Barcelona – and the bigger they are, the harder they fall. What happened next is legendary, too. A similarly plucky performance saw Chelsea win the Champions League against the odds, and to add that extra level of sweetness, it was their unforeseen victory which knocked Tottenham into the Europa League. Fast forward again to this season and there’s hope to be taken from that night. There’s hope to be taken from Wigan’s victory over Manchester City, too. We’ve seen that football is a sport where anything can happen, and not one where the conclusion you draw before the game is always the right one. But Chelsea can also take hope from a downturn in Barcelona’s form. They are not the side who won the treble in 2015, and with Neymar gone they are missing a piece. They might well be top of La Liga, but they haven’t sparkled much this season, and the 11-point lead they held just a few weeks ago has dropped to just seven now. Atletico Madrid are waiting to pounce over the coming weeks as the leaders will focus on the Champions League, whilst Simeone’s side start to care less and less about Europa League glory and vulture around Valverde’s team. Chelsea are not Wigan Athletic, though. They do not need to take positives from past displays when they felled giants. Tonight, given Barcelona’s form and the fact that Conte’s side are the English champions, they should feel on a par with the Spanish league leaders. They aren’t the plucky underdog they might think they are.